The boss of the IPA has suggested creative agencies do not need to worry about consulting and IT firms moving into marketing services. 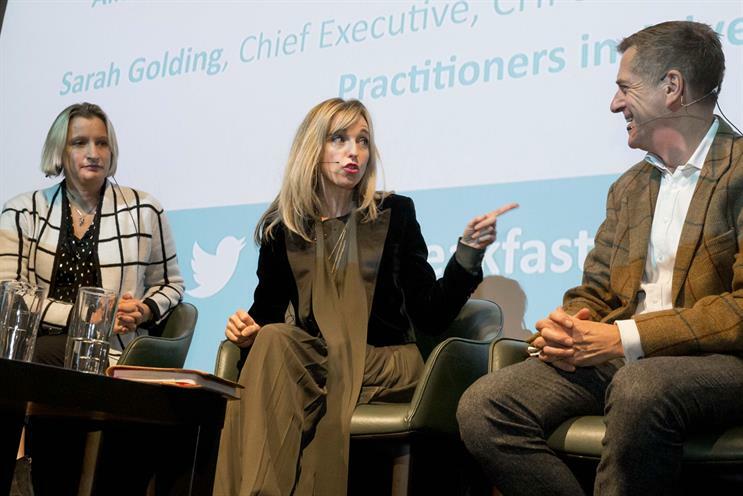 "We bring different skillsets, we work with different clients and our outputs are generally different," Sarah Golding, the chief executive of CHI & Partners and president of the Institute of Practitioners in Advertising, told a Campaign breakfast briefing, "Profiting from AI: The business opportunity", in partnership with M&A firm Results International. Golding, who was sitting alongside leaders from IBM and Accenture Interactive’s Fjord, said: "In general, consultancies work with clients to bring incremental change to business functions. "What we do in the creative [agency] industry is we develop the creative ideas that bring transformational change for brands and businesses. "I think we have complimentary skillsets. I don’t worry about the headlines in Campaign and the national press [about agencies potentially being usurped by consulting and software giants]." The IPA is the UK trade body for both creative and media agencies and Golding conceded: "I think the threat to media agencies is greater with the growth in programmatic and also the growth in clients’ media-buying functions in-house – there I think there’s a real threat." Most of the consulting and software giants have so far resisted moving into media-buying, but Accenture has begun helping some clients to take programmatic in-house. Accenture has also gone on a major acquisition spree, buying a string of creative and digital agencies, including Karmarama in the UK, Sinner Schrader in Germany and The Monkeys and Maud in Australia. Golding said: "There’s a reason why these guys are trying to buy creative agencies because they see the value of the brilliant, creative minds that live in agencies not just in the UK but throughout the world." Mark Curtis, chief client officer and co-founder of Fjord, who was also speaking at the breakfast event at the Regent Street Cinema, pointed out that his design agency is "a creative company", with more than a decade of independence before its sale of Accenture in 2013. Since then, Fjord has grown from 220 people in nine studios to 1,000 people in about 28 studios in the last four and a half years. "We’ve clearly found a home for creativity," he said. "I don’t think you can just say creative belongs here [in ad agencies] and it’s not in the consulting or technology companies because the world is becoming more complex than that." Curtis added: "The other thing is the dividing lines between advertising and experience are breaking down incredibly rapidly. I find it very difficult to distinguish between what is pure advertising and what is experience. And experience is also a creative area." Alison Davis, lead, industry solutions & business development for telco, media & entertainment at IBM, said her parent company also has a large creative division and an interactive experience agency which are "here to help enterprise". She recalled a recent, two-day "hackathon" event at a London ad agency, which involved collaboration between clients, the agency's creatives and a team of developers from IBM’s AI platform, Watson, who worked together on "some pretty hefty briefs". "The protoypes we actually built and presented two days later were game-changing and are now going into production," Davis said. Golding said the IPA is keen for agencies to find ways to work in partnership with IT companies, consultants and others. "Instead of being each other’s competitors, partnering hard and working together is where an exciting future lies," she said. Golding has used her presidency of the IPA to embrace technology since she took the role in April when she gave a speech urging the ad industry to "make magic with the machines".